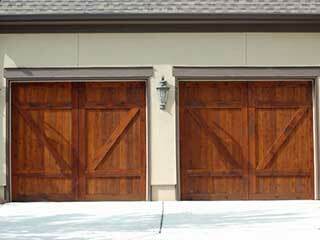 Home Blog Which Timber For My Garage Door? Garage doors that come in timber materials are made from some of the best types of woods, such as grade A Cedarwood, Oak, Iroko, Larch, Nordic Pine, Hemlock, Okoume, Meranti, Douglas Fir and Idigbo. Although most timber garage doors are made from grade-A cedarwood, there are many other options available to consider. All of the below are fine materials that can be harnessed to make bespoke garage doors with a beautiful aesthetic. The natural beauty of this wood will add beauty to your home and perfect it's from a distance and close-up. The main benefit of this wood is that it doesn't shrink or react harshly to changes in humidity and temperature. This means it's naturally able to withstand many environments and naturally resists decay over time. Oak is again a particularly durable material and tends to be resistant to warping which is a benefit. It is also a particularly distinctive look if that is what you're after. Idigbo timber is usually a pale yellowish to light brown wood in plain color. It is commonly used in both interior and exterior furniture and dries rapidly with little distortion to the appearance. This stability again makes this wood a great choice and also a relatively inexpensive option. Hemlock is a straight-grained and light option used frequently in moldings and trims due to the fact that it resists twisting and warping. One thing to bear in mind is that this type has only moderate resistance to scratching and dents. If you know you want a natural look, but find that real wood or customized options are not right for you. You may be surprised to find out that you can still achieve the look you want through faux-wood options. There are many timber-style finishes available today through other materials such as steel - we'll be happy to go through these options with you in more detail! If you've decided that a wooden look is definitely right for your home, our garage door repair technicians at Fort Lauderdale are here to help you make the right choice. Just contact our experts today and we'll be happy to advise.